“I’m Ben Droz, and we’re going lobbying”…. Ben Droz loosened the red paisley tie around his neck, pulled the knot over his head and replaced it with a skinny black cord made of hemp with sterling silver tassels at the ends. He reached into his pocket and pulled out a couple of plastic tie slides—a screaming eagle and a geometric wood piece—that would, when attached, turn the string into a bolo tie. “This one’s more subtle, more professional,” Droz said, selecting the wooden piece. He pulled it up the string toward his Adams apple. His bolo tie in place, he was ready to “go lobbying,” as Droz put it. Droz is the American hemp industry’s main man in Washington. As a registered lobbyist for Vote Hemp, an advocacy group that works to loosen hemp laws, Droz, a 27-year-old from Pennsylvania with a thick head of hair and caterpillar eyebrows that make him appear eternally excited, has made it his life mission to bring the Gospel of Hemp to the leaders of America’s capital city. For the past five years, Droz has loaded up a hemp briefcase with hemp products—hemp granola bars, hemp seeds and hemp paper, to name just a few—and walked the halls of the capitol building preaching the glories of hemp. You’ve heard of industries having an army of lobbyists. Hemp has as army of one, in the person of Ben. “It’s an army of passion,” Droz said. He has his work cut out for him. In the United States, there are tough federal restrictions on importing and growing live hemp seeds. As a variant of the cannabis plant which comes from the same botanical family as marijuana, hemp can be grown in a limited number of states only for industrial purposes, and only with special permission from the Drug Enforcement Agency. Because of these restrictions, most hemp products sold in the U.S. are made overseas and shipped here. When I met up with Droz on an April morning to see him in action, his schedule was packed with meetings, photo shoots and presentations about hemp. (When he’s not pushing hemp at the Capitol, Droz moonlights as a professional photographer.) His day would begin with a presentation to conservative activists, followed by a photo gig downtown. Then it was off to Capitol Hill to meet with staff for Colorado Democratic Rep. Jared Polis and Kentucky Republican Rep. Thomas Massie, two of hemp’s biggest supporters in Congress. Thence to the Phoenix Park Hotel near Union Station to scope out a venue for an upcoming cocktail reception for hemp supporters. After a meeting with staff of Democratic Sen. Ron Wyden,he ran across town to take headshots for a PR firm, followed by another shoot at a stand-up comedy competition near U Street that would last late into the night. Grover Norquist hosted Droz for his first stop of the day, the legendary Wednesday meeting of conservative activists organized by the anti-tax lobbyist for two decades. Droz, who voted for President Obama in 2008 and considers climate change one of the world’s greatest dangers, doesn’t necessarily consider himself a conservative. But cannabis advocates have made inroads with conservatives in recent years by pitching decriminalization as a states rights issue and a move toward a world with fewer government regulations. For his presentation, Droz chose to wear the red traditional necktie instead of his beloved bolo, which he left in a pocket. When Norquist introduced Droz as a hemp advocate, some in the audience chuckled. Droz ignored it, and launched into a brief speech about “harmful federal regulations” intended to appeal to the Reaganite hearts of the assembled. Droz rattled off statistics about hemp in the lobbying equivalent of an elevator pitch. It’s a half a billion dollar industry, he said, but most of the products have to be imported from abroad, and three new states removed their barriers to hemp production in 2014, bringing the number up to 13. “This is not really a controversial issue anymore,” he told the conservatives. Under current law, he said, the states need federal approval to grow hemp, and he needs help passing a bill to give states control over their own hemp laws without federal interference. Moroney smiled. “I know, man,” he said. They both laughed at his ribbing and Droz promised to get Mahoney some hemp granola bars, Droz’s most popular product. Indeed, in just the past few years, hemp in America has grown from an obscure plant used mostly to produce household decorations for stoners and latter-day hippies and into a source of goods that busy mothers can buy at Costco. In June 2013, 63 Republicans joined 162 Democrats to pass an amendment to the Farm Bill that authorized hemp research in states where hemp farming is legal. Encouraged by that victory, Droz is working to raise support for the Industrial Hemp Farming Act, which would amend the Controlled Substance Act by decoupling hemp from marijuana–thereby freeing up states to legalize hemp as they wish. On the right, the bill has support from Kentucky Republican Sens. Mitch McConnell and Rand Paul and Rep. Massie. With his presentation at the Norquist meeting over, Droz, juggling his hemp gear and camera equipment, rushed down the street for a photoshoot with a young real estate mogul at a DC’s City Center, a new complex of apartments, shops and restaurants. Droz fell in love with bolo ties a few years ago when he found that he could buy them made out of hemp and that nearly everyone he met would stop and ask him about his neckwear when he wore bolo ties. He became so obsessed that he even started designing his own ties out of hemp, which he sells on Etsy and promotes on his new website, YoloBolo.com. With his new neckwear in place, Droz caught the Metro to Capitol Hill. His next challenge: Educating Capitol Police at a security station of the Longworth House Office Building that hemp seeds can enter the building. Droz dumped a handful of yellow baggies full of edible hemp seed onto the conveyer belt for screening briefcases. An officer snatched one up and inspected it. “It’s hemp seed,” Droz informed her. “Totally legal.” In order to enter the United States, edible hemp seeds must first be sterilized, and these were. Waved in by the officer, Droz stopped for lunch at the bustling Longworth cafeteria, where he spotted Howard Wooldridge, a well-known former policeman and pro-pot activist from Texas who wears an oversized cowboy hat and a shirt that reads, “COPS SAY LEGALIZE POT ASK ME WHY.” Droz bought a salad and sat down. While I talked to Wooldridge, Droz ripped open one of the yellow baggies of hemp seed. “It’s time to hempify my lunch,” he declared, dumping the entirety of the bag over the greens and shaking the salad up to mix them in. Over lunch, Droz went over some of the challenges he faces as one of the only national activists for a cause few Americans think much about and that many lawmakers still see as a drug policy issue. That will take some doing. About the time Droz finished lunch, a lobbyist from the United Nations Foundation spotted the open hemp seed bag and walked over to introduce himself.“Where can I purchase those? You didn’t get this at the House cafeteria, right?” he asked, before picking up the bag and pulling it toward his nose for a sniff. “Smells like weed,” he said. I took the bag and smelled it. You could definitely discern an olfactory resemblance to hemp’s cousin. Droz, of course, can smell the difference. With his belly full of hemp seeds, Droz began his daily rounds to congressional offices. Over the course of a year, he will typically visit hundreds of lawmakers. Sometimes he holds long, pre-scheduled meetings with staffers sympathetic to his cause. Other times he just pops into offices to say hello and drop off hemp granola bars. “Sometimes I just do it randomly,” he said. When he arrived at Massie’s office, the staffers there greeted Droz by his first name. He and an aide sat down in the lawmaker’s personal office and discussed how they could gain more support across the capitol for the Senate version of Massie’s bill. So far, no one in the upper chamber is taking enough of a leadership role on the issue to do what it takes to get the bill passed, Droz explained. The theme is a constant one for the one-man, single-issue lobby shop. With so many pressing issues facing lawmakers, how do you get powerful people to care about a single plant, especially when there’s the risk that constituents may confuse it with support for an illegal drug? It wasn’t always like this. Before live hemp seeds became controversial–and eventually illegal–in the twentieth century, they were widely used throughout the United States for all kinds of purposes. In fact, hemp literally brought people to America. All of that changed under the Controlled Substances Act in the 1970s, when hemp was lumped in as an illegal drug with marijuana. Hemp fell out of fashion for decades and has only recently re-emerged on the American market as an eco-friendly alternative to a variety of products. “It’s been slow and steady progress over the years,” Vote Hemp President Eric Steenstra—Droz’s boss—said. In 2005, then-Texas Rep. Ron Paul introduced a bill to legalize live hemp seeds; he gained only a couple of co-sponsors. It wasn’t until the farm bill last year that the industry saw its first real win. “Over time we just realized that we had to go door-to-door and educate on this, and that’s what we’ve been doing,” Steenstra said. And that is exactly what Droz does on Capitol Hill, day after day. His meeting with Massie’s aide on Wednesday led to another meeting with a staff member from Polis’ office, where hemp enjoys support. Sitting on a couch next to Polis’ desk, Droz and an aide brainstormed as to how they could best encourage the DEA to start accepting live seeds inside the country. 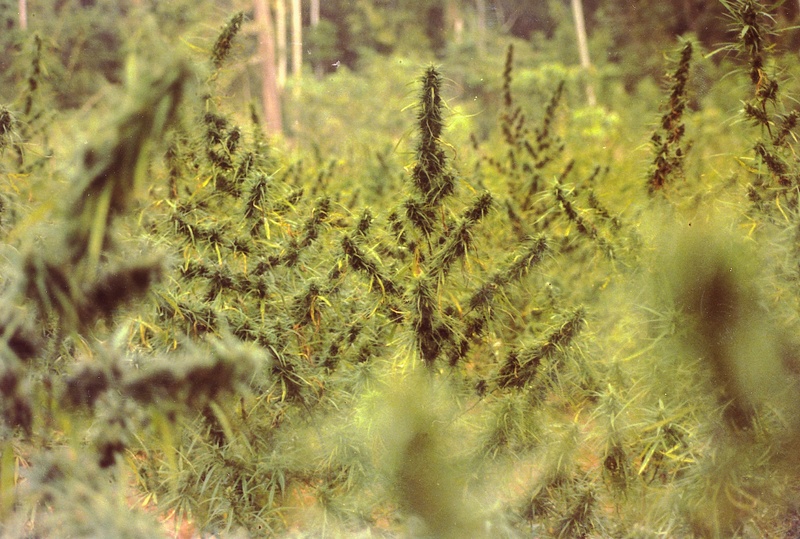 The DEA has said it’s in a policy review period, putting the hemp industry in a state of limbo. Lawmakers like Polis could possibly help, Droz said, by sending a letter to the DEA urging them to make a decision. Before the meeting ended, Droz told the staffer about Vote Hemp’s upcoming lobby day during Hemp History Week (the first week of June), when scores of hemp activists were planning a trip to Washington, D.C. Vote Hemp hopes to hold a reception for lawmakers and a briefing on the issue at that time. The staffer looked at his calendar, and informed Droz of one big problem: Congress won’t be in session that week. Droz took a deep breath. “I can only do so much,” he said. Before he left the Capitol, Droz ducked into California Democrat Zoe Lofgren’s office unannounced to thank her staff for her supporting industrial hemp farming. CONTINUE READING AND TO VIDEO’S HERE!